The list is out! In celebration of its 40th anniversary, the University of the Fraser Valley and the UFV Alumni Association have chosen UFV’s Top 40 Alumni. It wasn’t easy to select only 40 outstanding alumni. UFV has welcomed many students into its classrooms and labs over the past 40 years. Thousands of them have graduated and become alumni of the university. 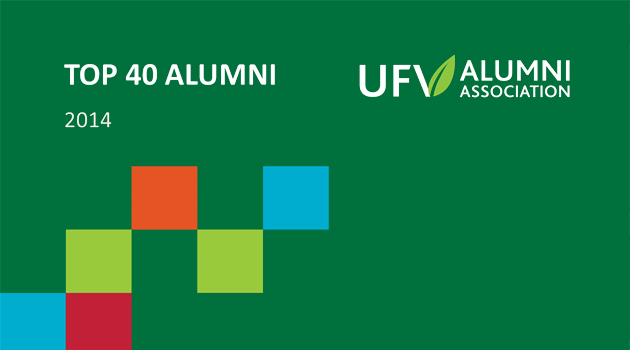 “The UFV Top 40 Alumni exemplify a range of exceptional qualities, from career excellence and leadership to acts of selflessness, courage, creativity, and innovation. We congratulate all of them on their achievements,” said UFV Alumni Association chair Justin P. Goodrich (BA ’12). The list includes alumni who attended in the early days of Fraser Valley College in the 1970s, those who helped plan and shape the new degree programs during the university-college phase, and recent graduates. More than 260 nominations were received for the Top 40 Alumni after a community-wide appeal. Representatives from the UFV Alumni Association and the university then selected the Top 40 based on a set of criteria that included community contributions, commitment to others, career/professional excellence, leadership, creativity/innovation, and acting with selflessness or courage. Chris Woods, UT ’90 — Artist whose work examines the impact of popular culture (Star Wars, fast food) on the mind of the contemporary individual .